I was booting up Vol. 2 on v1.4.0... I use clear data, and the instant I get to the screen below, there is absolutely no audio at all. It just cuts out without any explanation. I've done a myriad of things to try and solve this, namely get further in and then load a save from there (same thing happens; I reboot and load a save, sound cuts out again), use the latest build (v1.5.0-dev-1222-gb47c50a), use v1.2.1, even try and copy the Vol. 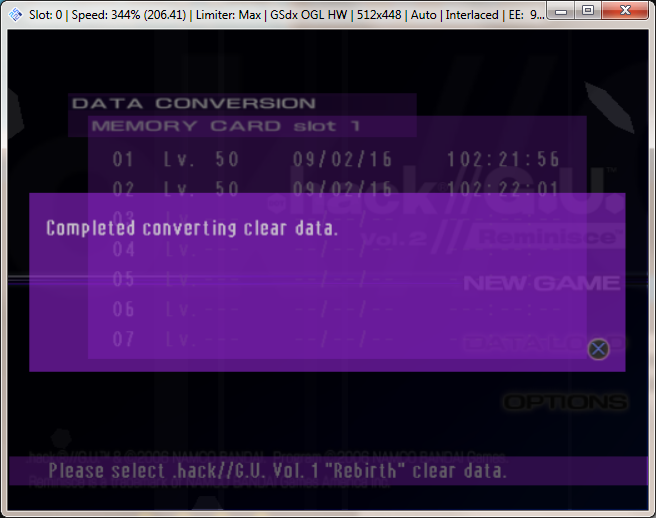 1 save data from one memory card to a freshly compiled one. The audio just keeps cutting out and I'm not sure what else to do. It's not any of my audio plug-ins, I don't think, because the sound WORKS fine on all plug-ins until that point. The weird thing is that, if I just go with a new game without loading any Vol. 1 Rebirth data, the sound is completely fine. Also this is my first time reporting a bug, so please bear with me. I've scrolled through the report list, haven't found anything similar to this. I am not using any hacks at all, and even with frame limiting it still happens. Currently using DirectSound, though I've tried XAudio as well. I've seen more problems than good things while using DirectSound. I tried again three times, just now, but unfortunately XAudio did not help. The sound still cuts out at the loading point. I have used an ISO of the game, and I have also used my actual PS2 disc, but both have the same problem. I'm currently using the PS2 disc. Also, what do you mean by posting a save? Do you mean post a screenshot? I apologize for sounding rather stupid here.